I so love gatte ki subzi and had not shared it as yet. 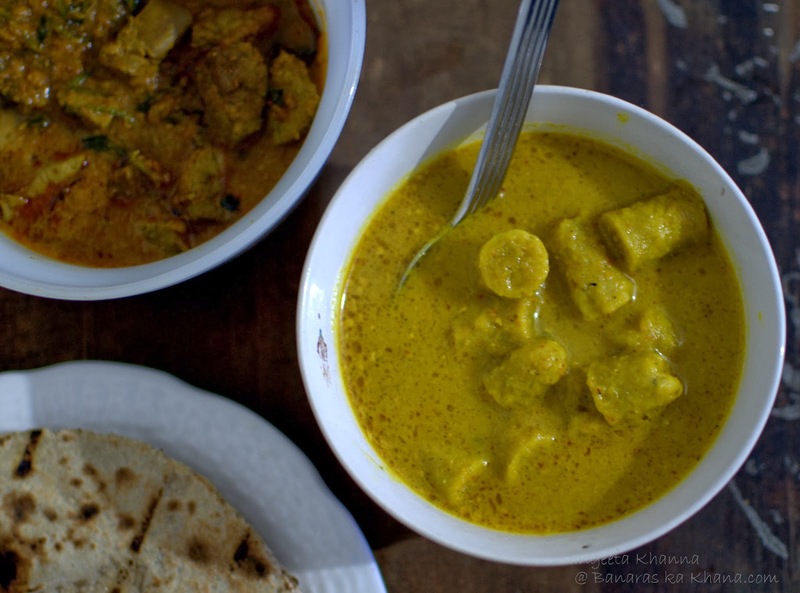 Gatte is a chickpea flour dumpling, cooked in a spicy yogurt based curry, sometimes in a tomato based curry too but the hot and sour flavors with robust spicing is unmistakable. More common in Rajasthan homes, gatte ki subzi is made in many versions by people outside Rajasthan. I remember we used to make a dry stir fry with a lot of onions and garam masala added, more like a finger food than a curry. I am tempted to make that version soon. 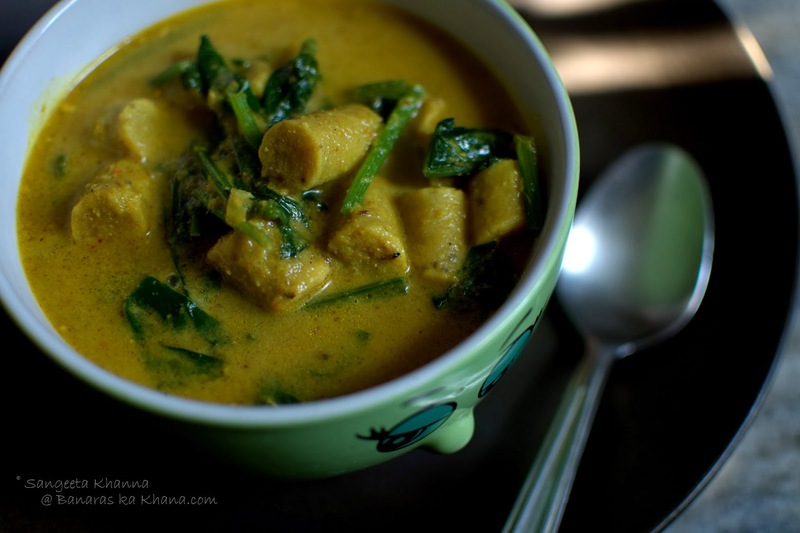 This gatte ki subzi is also made with spinach from my garden so it is special. But this time I actually cooked the gatte ki subzi without any vegetables added for dinner one day and then added spinach to the leftover the next day. Could not resist you know. Here is the plain gatte ki subzi which is seen with a mutton liver curry on the side. I make a version of gatte ki subzi without onion and garlic in the recipe too, but when someone posted a recipe on a facebook foodies group and then a friend Ushnish Ghosh tried the recipe, I wanted to have it just then. And I cooked it for dinner. The cooking of the gatta dumplings took about 30 minutes form scratch. 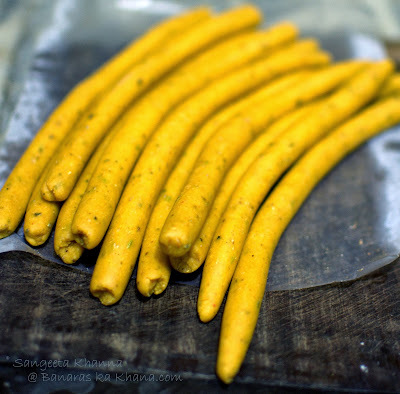 The besan was kneaded, rolled out in sausages and then boiled in water like we boil pasta. The cooked rolls were cut in one inch pieces and were curried in a yogurt based gravy. Knead everything together and make a stiff dough. Roll out sausages with greased palms. 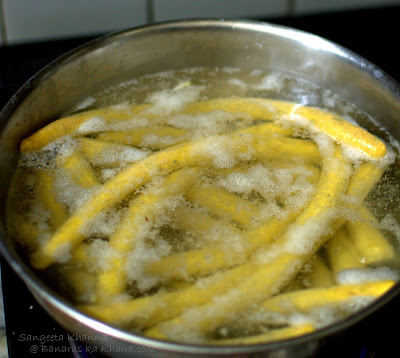 Boil them all in a pot full of water. The sausages would float up once cooked. Drain the water and cut the gatte in one inch pieces or as you like. This recipe will be a lot of gatte so you can enjoy some of them as it is or with a green chutney. Make a paste of everything put together, along with the yogurt. Heat oil in a pan and tip in this paste. Bhuno till the oil separates and the masala blend becomes aromatic. Add the chopped gatte to the cooked masala, add about 2 cups of water and simmer till the oil separates again. Add chopped spinach if required at the last moment, cover and let it rest till the spinach wilts. Serve hot with roti or rice or as it is. I like the spinach version as a one pot meal. Green coriander leaves tastes really nice with the plain gatte ki subzi. 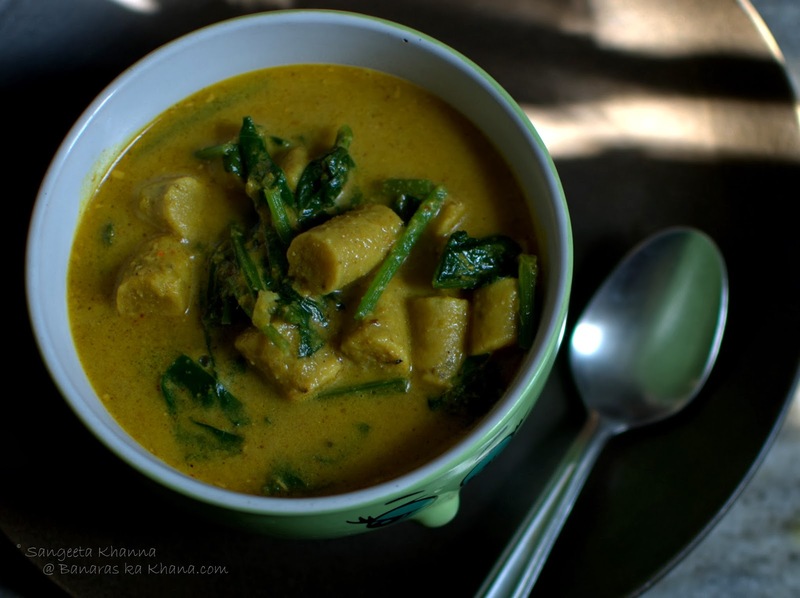 I keep making the gatte with bottle gourds, sponge gourds and even with some green peas thrown in. This is such a convenient one pot meal sometimes when I want spicy warm food. The gatte ki subzi is a part of an elaborate thali normally, served along with many greens, curries and many types of rotis and khichdi etc. For the lesser mortals, gatte ki subzi makes a meal. My favorite subzi.. looks tempting! !